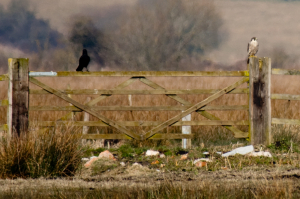 This heavily cropped shot turned out quite well considering the birds were barely visible to the naked eye. You'll probably have to view the full size image to keep both birds in view! The Peregrine sat on this post for some thirty minutes - having arrived from its' pylon perch (please see next observation).